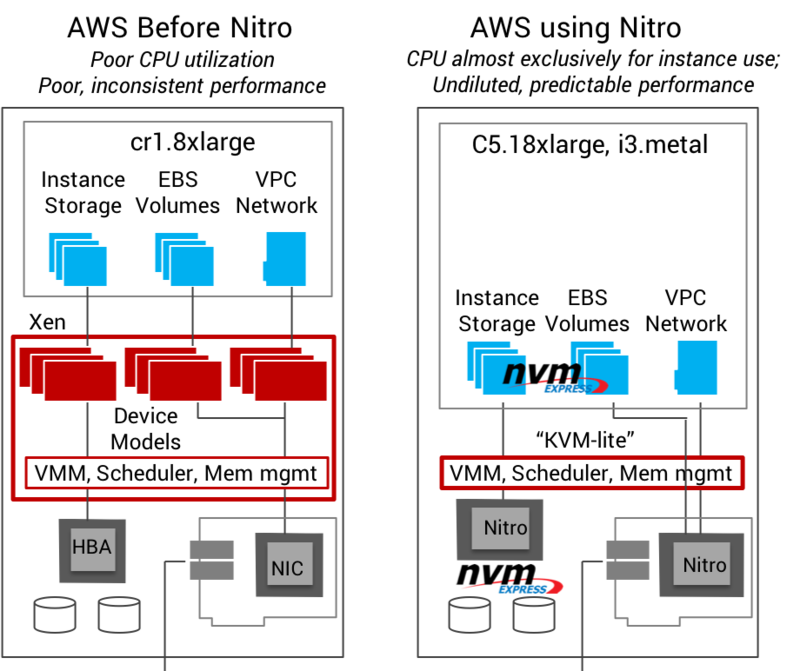 At the last Re:invent, Amazon announced their Nitro hardware and new KVM hypervisor-light for their new C5, M5 and i3 instances. The solution essentially leverages ASICs - created by the Annapurna team that Amazon acquired in 2015 - to deliver unadulterated, close-to-bare-metal performance to their new instances. The Nitro ASICs will reside on all new AWS host servers and replaces what Xen was doing for storage and networking - in effect, creating a hardware-hypervisor for all storage and networking services. Nitro represents yet another significant competitive threat for service providers competing with AWS in the public cloud, private cloud, or managed service arena. The Nitro solution reduces Amazon costs, while providing faster (read: near-bare metal) and more predictable performance for Amazon's customers. Nitro takes away the performance advantage many service providers were using to compete with AWS, because AWS can now match the performance they were able to achieve through optimizations for bare-metal and enterprise workloads. As an example, VMWare's hybrid-cloud partnership is built on top of this solution. What can service providers do to leverage hardware innovation to stay ahead? TechTarget's Storage Newsletter lists Attala as one of the top eight startups to watch in 2018 and asks "Is the pendulum swinging back to hardware differentiation?" Well, Amazon's Nitro proves that it is. The industry is investing in hardware, and Attala’s technology is here to help. Don't just react to competitive threats, but lead with hardware innovation. To find out more about how Attala can help, please contact us here.